Welcome back crafters! It's Monday...again, ugh. Lol. Did you all have a good weekend? I worked mainly in my craft room even though our temps are finally rising. We hit 70°F yesterday and I actually gave myself a pedi because I know flip flop weather will be here soon. Even my back pain has gotten a little better with the warmer weather.....thank goodness! Now I actually used four different Sale-A-Bration items on this card.....well actually I used five, but you can no longer get the ribbon so I didn't count it. I used the Part of My Story stamp set, Country Floral DTIEF, the Pearlized Doilies x2, and the Tea Time Framelits. I'm not sure if a lot of people realize that the Framelits go with a stamp set from the Occasions catalog called Tea Together. 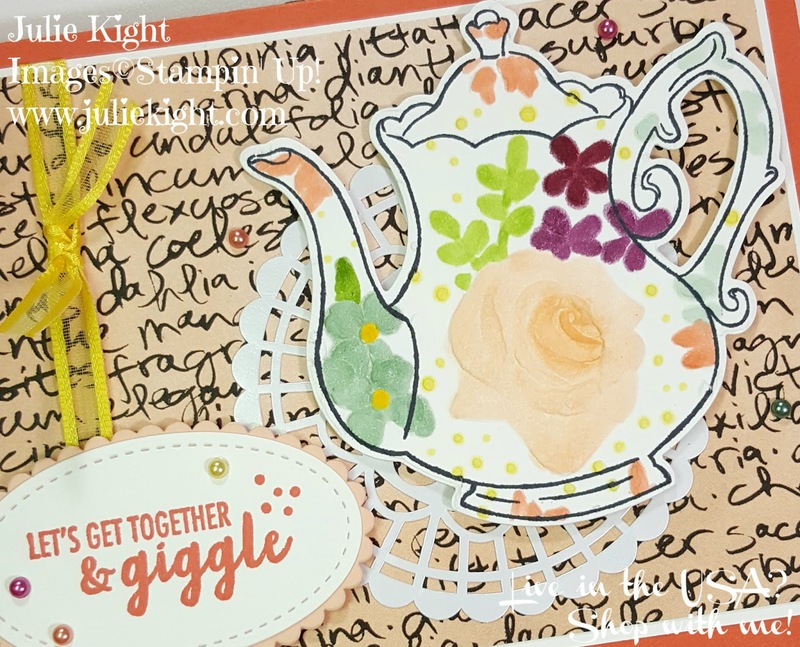 To make the tea pot I first stamped it onto some Whisper White cardstock. This makes it easier to line it up in the Country Floral DTIEF to get the impression that you want. I did it so that the larger rose was towards the bottom of the tea pot. 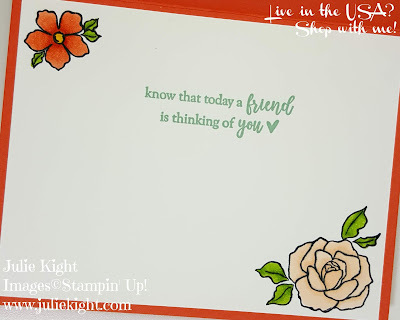 Also stamping it first is MUCH easier then trying to stamp the cardstock after embossing it. After stamping and embossing it then die cut it with the Framelits. 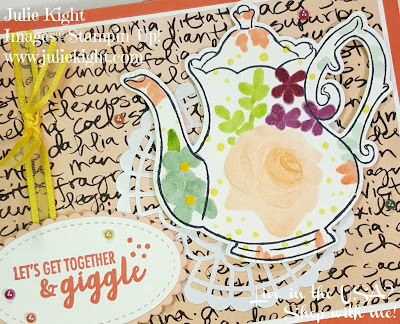 Then I had fun coloring the tea pot with the Stampin' Blends. For the inside I stamped with another stamp from Part of My Story and a couple of the flower stamps from Tea Together and again used the Stampin' Blends to color them. I plan on doing a Facebook Live later this week to show all of you how I color with the Blends. I know some people just use each one as a regular marker and some people like the look of depth you can get with them. 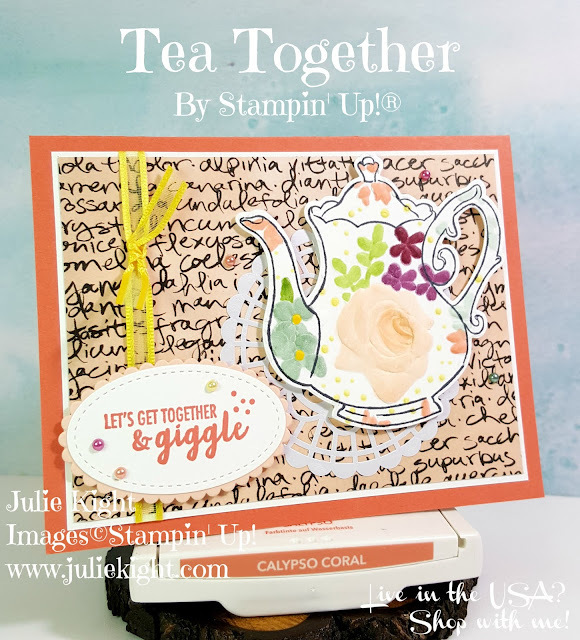 I will explain how I get the look I do with different stamped images. So thank you so much for coming to my post today and don't forget to come back tomorrow for another project using the Sale-A-Bration items. Have a great day!